Free, Clean & Easy-to-use FreeSmith Video Player! Music, Video, DVD, Blu-ray, all can be played smoothly with the smart FreeSmith video player. It supports almost all popular audio and video formats by default, including MKV, AVI, MP4, MPEG, FLV, WMV, HD and more. What you can do? Just throw your media files in, and begin to enjoy them with freesmith video player. FreeSmith video player is not only a video and music player, but also a smart free bluray player which allows you to watch blu-ray disc freely. Not all video players can support that, but FreeSmith video player did it! By now, our free video player supports 200+ blu-ray movies playback, and the quantity is increasing. Use freesmith free video player to play bluray disc, you are able to select subtitle, audio, title and chapter to enjoy. This video player software is a combination of free mkv player, mpeg player, hd video player, free flash player, free dvd player, dvd blu-ray player and more. FreeSmith Video Player comes equipped with all of the most popular video codecs, such as DivX, XviD, OGG, MP4, H263 and etc by default. In other words, it is rarely necessary to download and install extra codecs. That way, you won't get stuck with unnecessary codecs on your system. Screen capture allows you to take screenshot of your video directly from FreeSmith Video Player. A screenshot can’t meet your needs? Continuous screenshots is also available. Hotkey helps you to free from mouse. With keyboard, you can operate this free video player as same as do with mouse, but no doubt, more convenient! Hotkey is available for play, video, audio, subtitle, file and others. Faster and more smart! 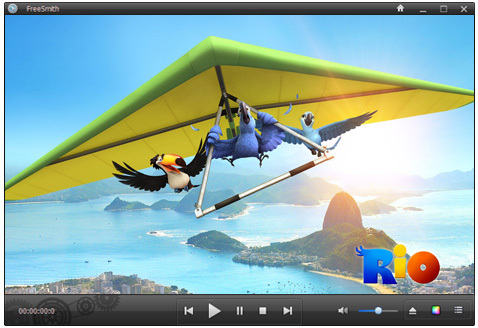 There are an extensive number of advanced features included in this free video player software. You can use software volume control (10-1000), adjust saturation, contrast, brightness, sharpen and rotate your video, adjust audio/subtitle synchronization and add subtitle, set the playback speed and seek time, manage playlist, and much more! Check your version of freesmith video player automatically. Catch up with the latest version all the time! FreeSmith video player aims to develop a fully convenient yet useful, free and clean software for you. So it is! 3G2,3GP, AMV, ASF, AVI, AVS, DAT, DIVX, DV, DVR, DVR-MS, F4V, FLV, IVR, M1V, M2TS, M2V, M4V, MKV, MOV, MP4, MPE, MPEG, MPG, MPV, MTS, OGM, QT, RM, RMVB, SMV, SWF, TOD, TP, TS, VOB, VRO, WMV, WTV etc. MP3, OGG, WAV, AAC, WMA and etc. FreeSmith Video Player is an all-in-one media player to play videos, musics, Youtube videos, protected DVD movies and even blu-ray discs free for everyone. Enable hotkey operation, screenshot capture, autoload subtitles, software volume control and much more. FreeSmith dvd blu-ray player offers you options to choose your favorite subtitle, audio, title or chapter to enjoy. In this way, you can easy access to or jump to the part you would like to watch and enjoy the wonderful blu-ray movies with your preferred language. There are six tabs: File, System, Video, Audio, Subtitle, Hotkey and Others. In each tab, you can make different settings. There are there are six tabs: Play, Video size, Video color, Video crop, Screenshot, Sync. In each tab, you can make different settings.